It has been nearly a month since I have done the ‘Secret Garden’ day class at the Royal School of Needlework. The ‘Secret Garden’ is a design featuring ribbonwork and stumpwork embroidery techniques and has been designed and was taught by Helen Richman of The Bluebird Embroidery Company. The design actually features in her forthcoming book Stumpwork Embroidery: Techniques And Projects which will be published in the autumn of 2017. The book is available to pre-order from her website. During the day class, we learned the various ribbon stitches and completed one stumpwork petal. During a day class, the tutor always demonstrates on a different student’s project in turn and one mine Helen demonstrated the silk shading on the flower petal. It was really useful to have a perfect ‘real’ petal as an example to work the other petals from but I decided against using Helen’s petal in the final piece, those petals are all my own work! In contrast to other kits, this kit, like the others from The Bluebird Embroidery Company included plenty of threads and ribbons. I really like that, because it gives you the opportunity to unpick if you are not entirely satisfied with the result, without having to worry whether there will be enough threads left. Having enough supplies in a kit will therefore always aid a better result. The ribbonwork I found very fiddly, especially trying to get the ribbons to stay put. It is really easy to catch a ribbon at the back of your work with your needle which pulls the carefully arranged flowers on the front destroying the look. The materials I had left over. It is quite repetitive to stitch 10 nearly identical petal, especially if you do it in an ‘assembly line way’ like I did: couch all petals first, then complete all of the buttonhole stitches and then fill all of the petals with long and short stitch. However, I did find that repetition does improve your stitching and you do gain speed! I stitched a small couching stitch at the bottom of the wire to keep them flat and to prevent my embroidery thread catching them. Even though you have to apply some clear PVA glue to the back of the petals and leaves to prevent the stitches from coming undone and to prevent the fabric from fraying, it is quite scary to cut them all out so close to your carefully worked stitches. You can still see some very thin white edges around my petals but I just didn’t dare to cut away any more! 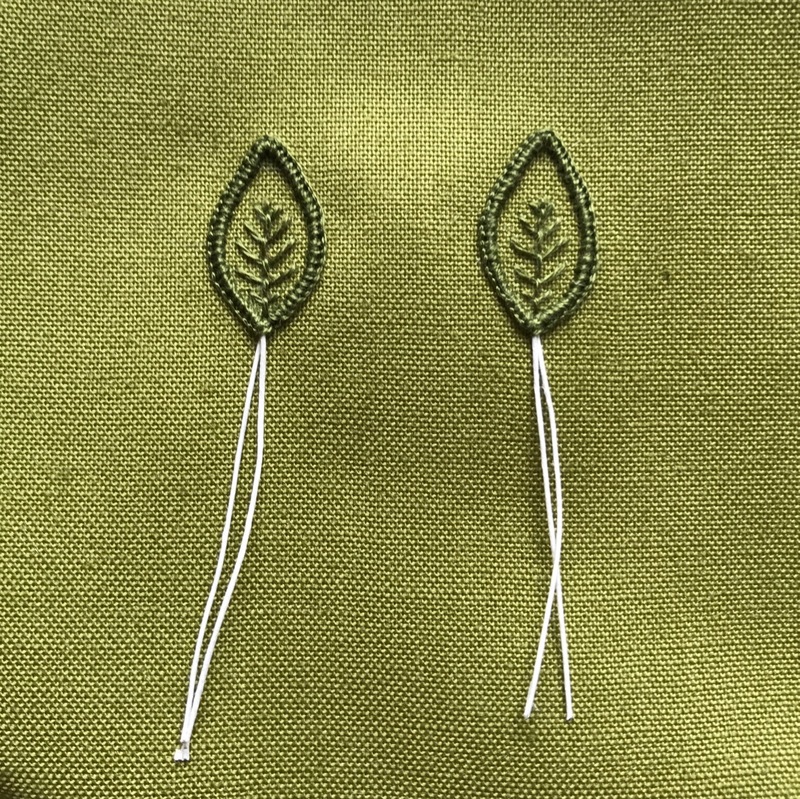 I used sewing thread, in a colour to match the background fabric, to attach the leaves and petals as I found it less noticeable than using the embroidery threads which were supplied. After attaching the petals I ran the thread around the base of the petals and tightened it to pull the petals closer together. I used transparent sewing thread to attach the key and the lock to the background fabric. As before, I have e-mailed my tutor Helen Richman with a few photographs of my finished project. “Again, let me say that your work looks wonderful! I am so pleased to see the finished design and you have worked it very nicely. Thank you so much for showing me. 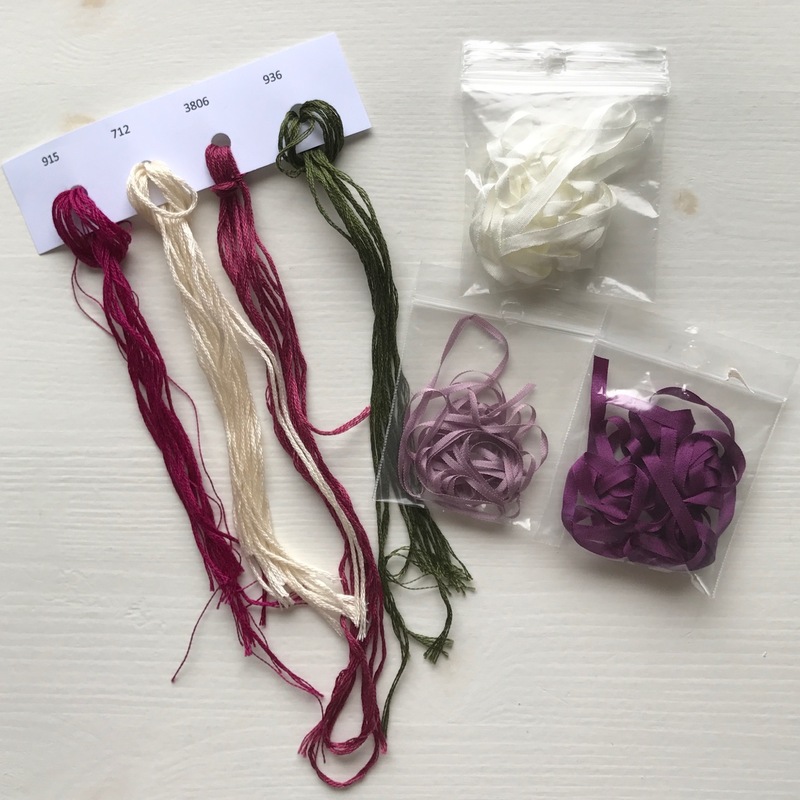 Ribbonwork can be tricky, as you say finding places to start and finish threads neatly can be difficult, especially in places where there is not much embroidery around to disguise it. Looking at the back of your work I think you have done a good job to overcome this. At least if you decide to incorporate ribbonwork into other pieces of embroidery you can now be a little more considerate of this and plan ahead with where you will place it and at what point while stitching a design. 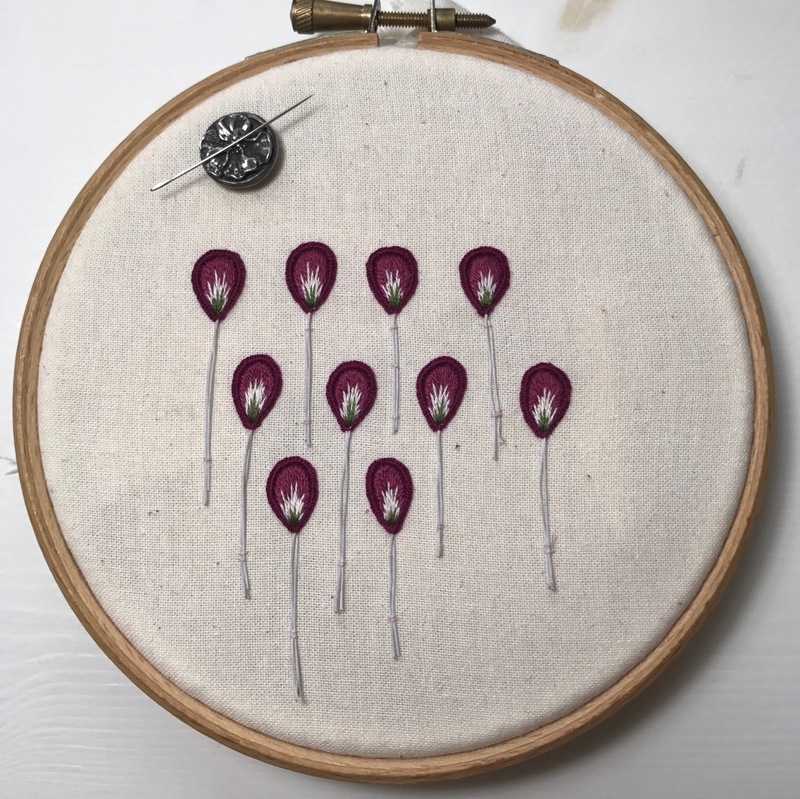 Ideally, you want to create the surface embroidery work first and enough of it so that you can use the stitches on the back for finishing ribbon threads. You also want to create ribbonwork after surface embroidery stitching to reduce the risk of accidentally catching the ribbon stitches with an embroidery needle and potentially ruining lovely looped and raised shapes created with the ribbon. the petals are looking beautiful! Thank you for sharing! I saw the Secret Garden class on the RSN website and it looked wonderful. It’s so nice to see someone’s finished piece, and also to know that you get such great feedback from the tutors! Thank you! That is why I like sharing: to let everyone know what a class/kit is like, what kind of things I found difficult/easy and which tips/tricks I have to help others doing a similar project. I saw the finished piece on Instagram and it looked gorgeous. The stumpwork petals looks amazing up close. I’m not a huge fan of ribbon embroidery, I find it too fiddly for my tastes. I still want to master it thought. I have a design that I started that I really should get around to finishing. Thank you Dima! To be honest I am not the biggest fan of ribbonwork. I always think it looks very old fashioned on its own, but I liked this combination with the stumpwork. I totally agree on the fiddly aspect! You can also colour the calico with suitably-coloured Inktense blocks, fixed with Aloe Vera gel from the chemist. 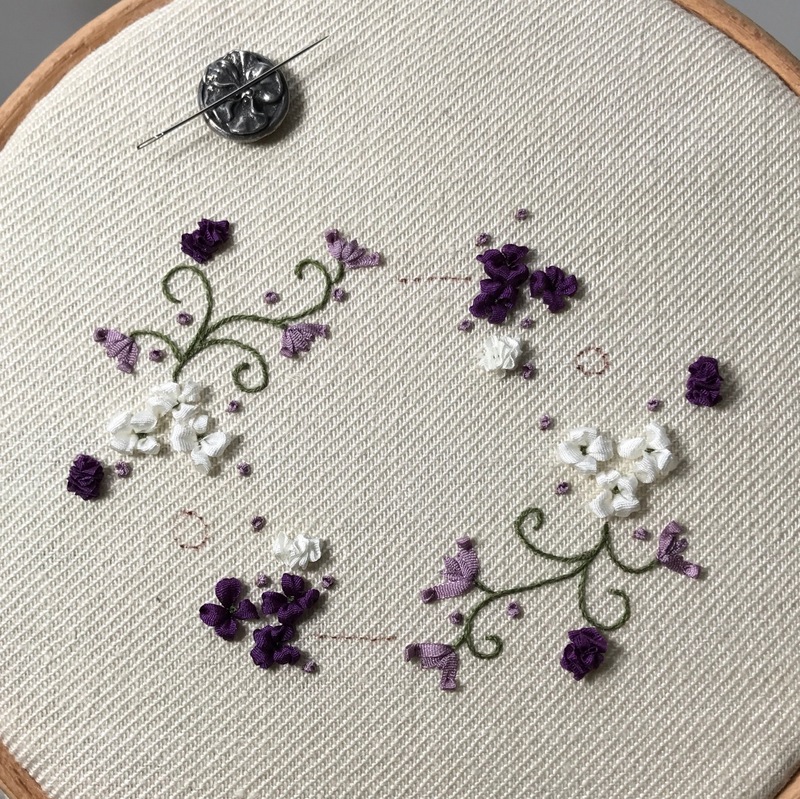 Another blogger told me of this trick, and I did it on the stumpwork violets I did a while ago. This sounds like a great idea as you can’t get fabric in every colour, but running the risk of sounding ignorant, what are Inktense blocks and how do I use the Aloe Vers gel to fix it? may or may not give you some useful ideas. Thank you! I’ll go take a look! It looks lovely, well done! A very pretty design. It’s good to know she gives a good supply of materials. There is nothing more frustrating than a frugally compiled kit! This looks so pretty and it is always useful to know what kits contain and how good they are. Your stitching over the petals and leaves is extremely neat. Love the colours too. Thank you! Yes, the kits by The Bluebird Embroidery Company are well recommended. You can buy them on her website, and some designs are also taught at RSN-classes. I took her 3d goldwork bird course and that was fab! I didn’t know that is a course as well! Would love to do that one as the kit does look a bit scary to do entirely by myself! I really enjoyed the course – but I hadn’t done much goldwork before , so definitely needed help.